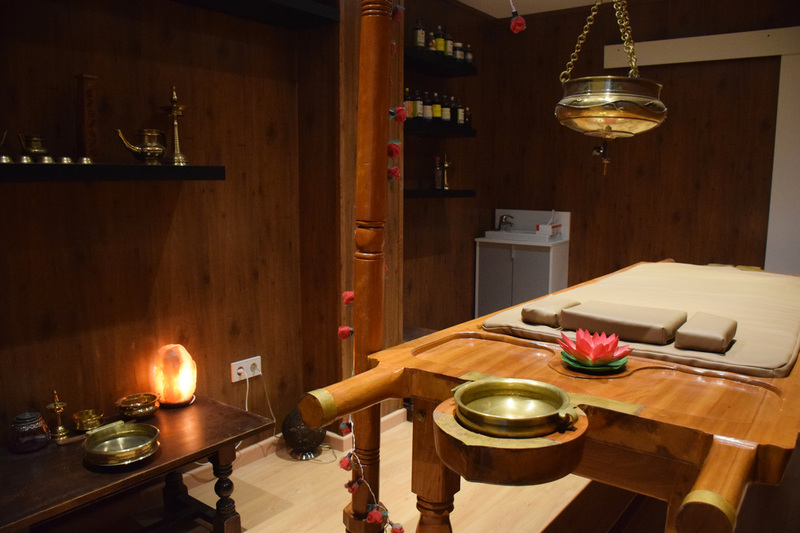 Therapies performed by Ayurvedic therapists trained in India and AyurVida Ibiza. 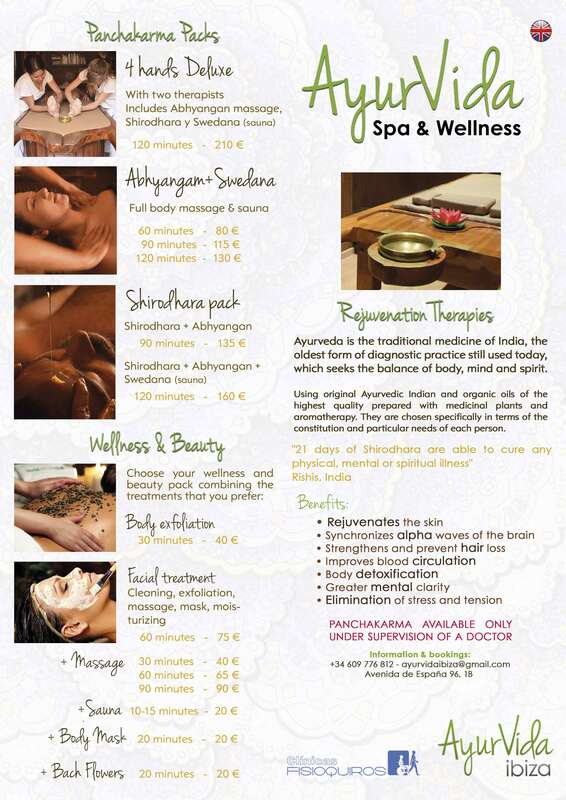 To receive any treatment or Panchakarma, before you need consultation with the doctor. Abhyangam is a Sanskrit word, which means application of oil throughout the body. The ancient Ayurvedic textbooks recommend it as an integral part of the daily routine for all who wish good health and longevity of life. It is relaxing and refreshing. 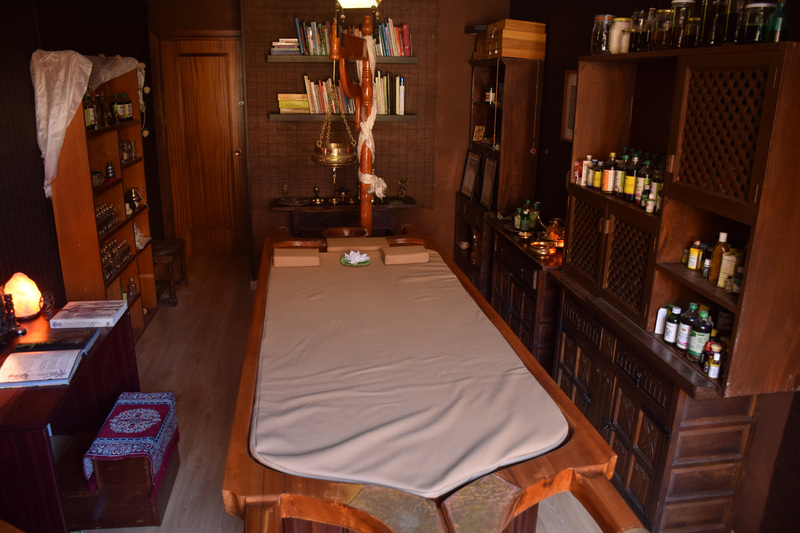 A full body massage with herbal medicinal oils to take care of the physical, mental and emotional well-being of the person while balancing the doshas. The Shirodhara is the Ayurvedic star treatment, consisting of a constant flow of medicinal hot oil on the head for 40 minutes, an incredible experience that calms the mind deeply, reduces nerves, stress, anxiety, insomnia, rigidity … feel this state of deep peace and physical and mental well-being. Sweda means “to sweat or sweat”. So Swedana is the process of inducing sweat with the help of steam, generated from decoctions of medicinal herbs. It is the preoperative procedure in the various Ayurvedic detoxification therapies, where the goal is to dilate the body’s channels to separate the toxins from the tissues. Its very important to keep your head out of the heat. The Ayurvedic sauna is usually used after an oil massage. All massages are made with original Ayurvedic oils from India and premium organic oils prepared with medicinal plants and aromatherapy. 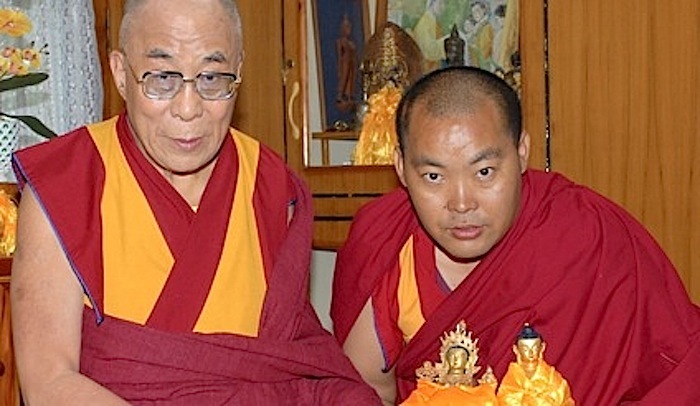 The oils are chosen specifically according to the constitution and the particular needs of each person. Ayurvedic massage works by nourishing, balancing, detoxifying and relaxing the body in its entirety, both physically and energetically. It includes oil for the abhyamgam and in the case of the sauna the essential oils. The rest of the treatments do not include medicines that can be traditionally made or obtained from other sources without extra charge.